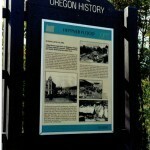 A flash flood swept down on Heppner, and caught residents unaware, killing hundreds and destroying nearly the entire town. A cloudburst hit in Balm Fork Canyon, south of Heppner. The rushing waters tore down the narrow canyon, picking up haystacks, chicken pens and livestock and piled it all up behind a steam laundry that straddled the canyon near the edge of town. This very effective dam held until enough water had built up to break through it, and it was that wall of water that hit Heppner. The sultry late Sunday afternoon found many of the 1146 residents of Heppner sitting down to supper or getting ready for evening church services despite the storm in the air. Black clouds rolled out of the south and at 5:15 p.m., a flash of lightning stopped the town clock. The flood and storm arrived at the same time, and the pounding rain and hail storm effectively drowned out the roar of the approaching flood waters. Unsuspecting residents had no warning of their plight until the buildings they occupied began to tremble and move. Many made it to safety. Many did not. More than 250 bodies were recovered; not all were identified and not all those missing were found. Bruce Kelly and Les Mattock became heroes by racing the flood waters by horseback to warn the communities of Lexington and Ione of the coming danger. By the time the waters had passed, only the three story brick Palace Hotel and the new stone Roberts building remained relatively unscathed on Main Street. There were many eyewitness accounts of personal heroism and devastating tragedy. 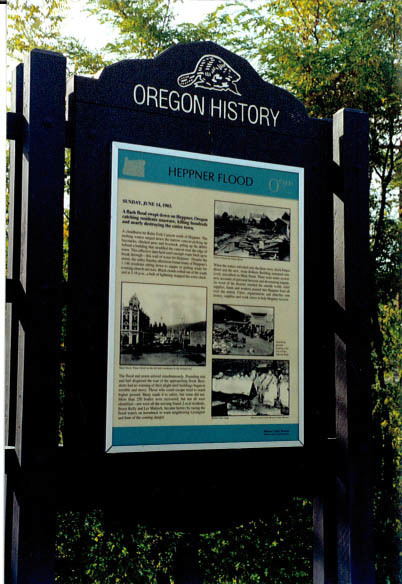 As word of the disaster got to the outside world, relief supplies, funds and workers poured into Heppner from all over the Northwest and the Nation. Cities, organizations and churches sent money, supplies and work crews to help Heppner dig out and recover.